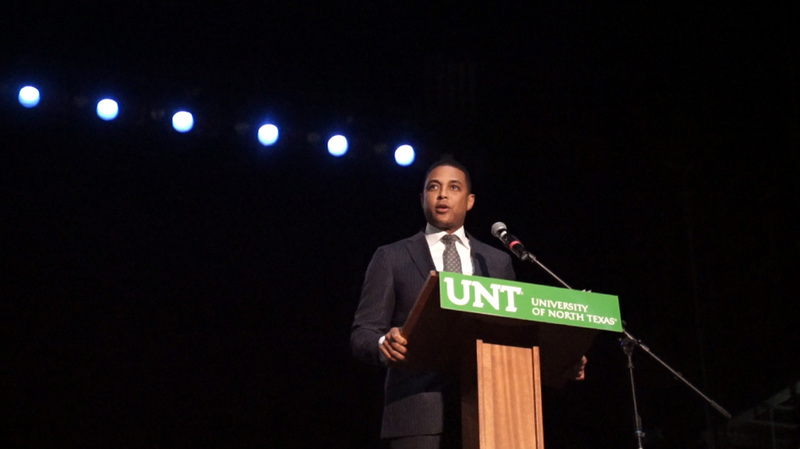 The UNT Distinguished Lecture Series (DLS) concluded its theme of activism for the 2018-2019 season by welcoming TV journalist Don Lemon to the UNT Auditorium on March 21. Previous speakers this season included activist Amara La Negra and U.S. Olympic Gymnast Aly Raisman. Lemon is a veteran TV journalist and trusted source of information from CNN, NBC and MSNBC. Relatable and charismatic, his award-winning work defies genre, candidly exposing injustice and the resiliency of the human spirit. A true product of the modern news age, Lemon discussed how he has embraced social media’s power to reach viewers. An inspiration to diverse audiences, he shared his hard-fought rise to primetime as one of the most prominent African-American and gay men in TV news today. For more information on the Distinguished Lecture Series, visit http://studentaffairs.unt.edu/distinguished-lecture-series.